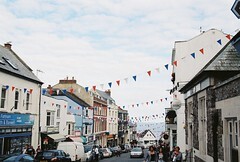 Lyme Regis, a photo by Matt Knott on Flickr. The Scottish school holidays typically finish in mid-August (like in Denmark). For instance, next year in Glasgow the pupils return on Wednesday 13 August 2014. This means that the independence referendum on Thursday 18 September will take place more than a month after most people have returned from their holidays, so there’s plenty of time to discuss the pros and cons with your family, friends and colleagues. On the other hand, English schools go back much later, typically in early September. This means that lots of English people will not really have come out of holiday mode before the independence referendum takes place, which should be a good thing because it would lead to slight less interference from London-based media. The more I think about it, the better I like the choice of date for the referendum.